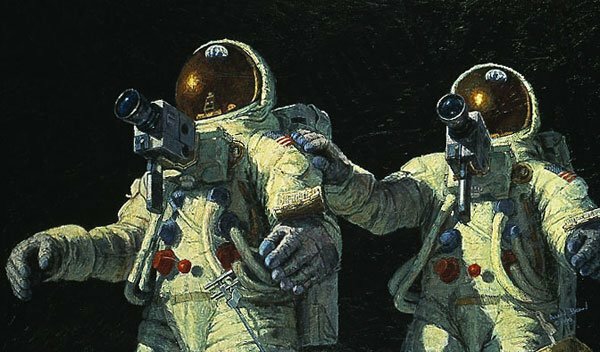 Image Size: 24"w x 13 5/8"h.
"I have painted Pete Conrad and myself 239,000 miles from Earth during the Apollo XII mission, standing on the Ocean of Storms, looking homeward. Pete and I had come a long way together. He is the best astronaut I have ever known. As we looked up, the sky was a deep shiny black. As I touched Pete's shoulder I thought, can all the people we know or have seen or heard about actually be up on that tiny blue and white marble? It was a wondrous moment."